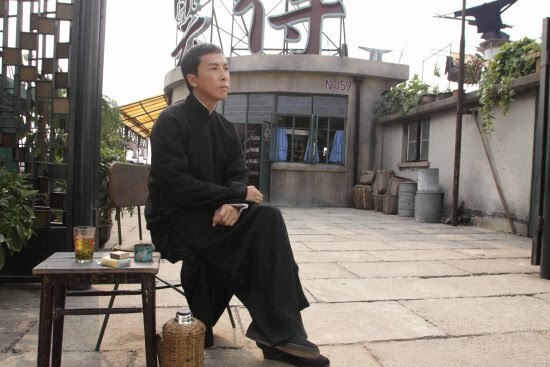 During the Sin-Japanese War, Ip Man (Donnie Yen) defied the Japanese and used wushi to combat their aggression. After the war, Ip Man's family experience hardship in Foshan and eventually moved to Hong Kong start life anew. Ip Man plans to teach "Wing Chun" on the roof of a building owned by newspaper editor Kan Leung (Pierre Ngo). A young boxer by the name of Leung Wong (Huang Xiaoming) and his friends asks Ip Man to become their master and thus, Ip Man gained his first pupils in Hong Kong. Ip Man's pupil Leung Wong is then kidnapped by bully Wai-Kei Cheng (Yu-Hang To). Ip rushes to a fish market to save Leung Wong and there he meets the bully's master Chun-nam Hung (Sammo Hung). Master Chun-nam Hung informs Ip Man that if he wishes to teach wushu in Hong Kong he must accept challenges from masters of all wushu types within the time of burning a joss stick. 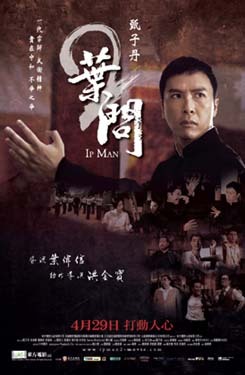 Ip Man realized that he must fight these other masters and so took on the challenge. The last challenger to Ip Man was Master Chun-nam Hung. The two masters fought to a stand still by the time the joss stick finished burning. Master Hung admiring the skills of Ip Man and was now allowed open his own wushu institute. Nicky Apr 05 2014 10:24 pm I could swear one of the Brits was Nick Pope. He looked and spoke just like him. I've been looking for his name in the cast list but couldn't find it. I thought the movie was really good, too. The fight scenes didn't go on forever like the Kung Fu movies of the '70s. Lori W. Bahadur Feb 07 2014 5:55 pm What is the name of that adorable, XL, chubby-cheeked boy that played Mr. Hung's son?!?!?! He was so pinchable! I loved that look when Mr. Yen's character swings him up in his arms! So sweet! And then Mr. Hung takes him, and all the pinchiness! I squealed! I loved it! Aldine Jul 11 2013 2:47 am Grand Master IP-Man is and was the best focus on the balance and strike on the movement. Donny Duke Feb 13 2012 11:39 pm Ip Man What Hide Are You? Alright, Turn it down. Takin’ off. Works just fine. I know the magic. I know the focus. Incoming, A bomb, A saturated missile: Human Roger All wet. Coming. What’s it gonna be? You really need to say more. Children, How about some China in your worldview? – Like masters of the universe. What happened? It’s the same old story. A culture Gathers some rise A hand-me-down Takes over: We are so big and strong. Keep building Grow this peanut Show who’s bigger The human element. I come to buy land In the humanity we all are, Love it too. Kes Jun 12 2010 12:29 am well first was pretty well....second was ok, but had more action... although story may appear weaker, he was actually fighting for his nations pride after the event with japan in the first so its more of an account than for entertainment.... if its entertainment your looking for, there are 2 more to be released this year.... lol, i cant wait!!!! wing chun rules! = Jun 06 2010 6:32 pm This movie lacks a lot. Story was really boring and not that much great action. It reminds me too much of Fearless, but Fearless was better. BongFongSong May 23 2010 6:50 am A Hell alot more action than the first movie, however the story is weaker than the first. Jon May 16 2010 11:44 pm This movie was just OKAY. hadi May 13 2010 11:06 am IP MAN fight to 2 veteran actors on the table before he fight to SAMO HUNG , anybody know the name of the 2 veteran actors ? ran May 05 2010 7:15 pm Very Good..